Hello everyone. All About Labradors blog would like to introduce one of our new sponsors, Dog Lover Headquarters. At their website you can find some neat gifts for yourself or anyone with a love for the Labrador Retriever. When you get a chance, please visit their website and while your there, tell them hello from the All About Labradors blog. Take care of yourselves and your Labrador Retriever! This is part two of a two part e-mail from KBWSPIN (Karen) in regards to her Labrador Retriever who has a high level of energy , is difficult to handle and has a few others problems that she needs help with. Thanks for writing me back, Yes, I do have a name and it is Karen. We did buy our lab from a breeder. We have gone to two different trainers. Both trainers told me the same things. First he is one of the more difficult labs that they have worked with, meaning he has that extra energy that goes beyond the average lab (my vet like I told you agreed, he has seen many dogs and labs over the years and he definitely finds him more stubborn, hard headed, and hyper and difficult to control. I have a hard time just holding him back when I walk with him. He still is very mouthy at eleven months old. He has been to the vet at least five times for eating things he shouldn't be. He gets sick throwing up and diarrhea. He jumps on people constantly. I had a x policeman who trains search dogs and narcotic dogs also work with us. He ended telling us to buy a collar that can give him a shock to stop bad behavior. That was a few months ago, although that does work we are rarely actually shocking him. We tend to warn him instead because we feel bad shocking him. He is crated during the day, usually not more than five to six hours at a time. Sometimes less. It has been very cold outside so we haven't taken him on many walks during the winter months. We do have a fenced in yard but he doesn't want any part of running around back there unless someone is out there with him. Once the weather breaks he does get plenty of walks. It is hard just keeping his head from cleaning the sidewalk he is a human garbage disposal. I hope this information will help you an then you can help me. I don't feel giving him away is an option because my kids don't want me to even though they do nothing to help take care of him. Thanks for the responses to my questions. I’m glad you feel not giving him away is an option. I also had to laugh at your "even though they do nothing to help take care of him" comment. Now, isn't that always the way with the children? They want the dog, beg for the dog, and then don't do anything for or with the dog. I understand that both trainers and the veterinarian are stating he has extra energy, is stubborn, hard headed, hyper and difficult to control, but what happens after that. Do they tell you anything you can do for him, with him, or is that it. It seems like the only one who had any advice was the policeman. The trainers do not want to train him? More often than not, the hyper behavior is caused by too much energy and a need to release all this energy. There are also more and more disreputable breeders with very little knowledge on breeding Labrador Retrievers, and have less regard for temperament than that of the established breeders. These disreputable breeders don't produce well balanced, good tempered Labradors. One other thing I didn't ask you Karen was - What happens to your Lab (what is his name) when he does these bad things (eats toys, walls, pulls on leash)? First thing we are going to talk about Karen is obedience training and the Alpha dog. The obedience training doesn't solve all behavior problems; however, it becomes a foundation for solving just about any problem. Effective communication is necessary to instruct your Labrador Retriever with what you want him to do. What the Alpha dog basically comes down to is - Who is the leader. Dogs see all the people and other dogs in the household as a pack. Each person in the pack has a rank, with a top dog. Your Labrador Retriever's rank should be at the bottom of the pack. You and everyone in your family are ahead of him and he must understand this. First off Karen, training has got to be consistent, might be frustrating, and won't happen overnight. You will have to keep on correcting him, possible hundreds of times. Whenever you want your Labrador Retriever to do something, you must TELL him, not ask. Remember, you are the boss, the top dog. You (and your family) are the one that makes the rules and give the orders. Stand up nice and straight, and in a firm voice TELL him what to do. Always remember this! What you’re going to do is to teach your Lab the sit command (if he doesn't know it already). When he does, reward him with praise and a treat. Karen, you don't have to get crazy with this, just a Good dog, or Good boy in a happy tone and then a treat. Now when it comes time to feed him, walk him, play with him, your going to TELL him to sit. When he does, praise him with the Good dog, or Good boy, give him the permission with an Okay and then give him his reward (his food, playtime, etc...). If your Labrador doesn't sit, you’re going to walk away from him and ignore him. Remember, No Sit, No Reward. Make sure you state your sit command in a good firm voice and if he doesn't obey, walk away and ignore him. You will try again a little later. What you want your Lab to learn is to respect and obey you. His place is at the bottom of the pack, nowhere else. Your Labrador Retriever's mouthing / nipping will stop, but you’re going to have to train him that this nipping / mouthing is wrong. I have written an article on this subject that you can find on the All About Labradors blog. Labrador Retriever – Training your puppy to stop biting and nipping. Follow the procedures in this article, making sure you're CONSISTENT with the training (this goes for everyone in your household). For chew toys for your Labrador Retriever, I recommend and love the Kong toys (make sure you get the proper size for your Labrador). The stuffed Kong toys can keep him busy (and out of trouble!) for long periods of time by encouraging them to get the food reward inside. They also provide plenty of physical as well as mental exercise for him. High energy Labradors needing plenty of daily exercise (physical and mental). Long walks (at least a half hour) and runs, plenty of toys and chews, and games of fetch will help to calm by tiring him out. A tired Lab is a good Lab. The hyper dog launcher will help to keep your hands clean and dry, and save your arm. Inside you can play games like "find the treat" and” hide and seek" (let me know if you need more info on these or other inside games). Many recommend a swift knee to the chest or stepping on the paws. My thoughts on both of them are, absolutely not. Why? Because it's a great way to hurt your Labrador Retriever (broken ribs, cracked bones in chest). Person # 1 stands holding your Labrador Retriever on a short leash, making him sit. Person # 2 starts with you Lab's favorite dog treats in his pocket, standing approximately 10 - 20 feet away and starts approaching your Labrador. If your Labrador jumps up on person # 2 as he/she approaches, they will immediately turn their back to your Lab and leaves. Person # 2 is not to make any further eye contact with your Lab, no vocalizing and no touching. Just a turn of the back and walk away. You will start this exercise over every time your Labrador jumps. When your Labrador Retriever does not jump when approached, the approacher should offer him one a treat, pat him on the head, praise him with Good boy, or Good dog, and then walk away again and re-repeat the whole approach again. Continue training in this manner. Every time he jumps turn and walk away, every time he doesn't, treat and praise. Make practice sessions short 5 - 10 minutes at the most, as you don't need your Labrador getting bored of this exercise. As he starts to master this exercise, you can make the sessions longer. Make sure you always end his sessions on a high note, this being your Lab successfully not jumping. Never, ever should your Lab be pet when he jumps on people, as he will think this is good behavior. Also remember to change up people in the number two person’s position, this way your Lab just doesn't learn not to jump on that one specific person. Patience Karen, this might take some doing. When your Labrador jumps up, you or whoever he jumps on are to grab onto his paws and hold them up so that he can't get back to the floor. Do it without hurting him, and just be prepared to hold on. Eventually he is going to want to get down and he will try to take his paws out of your grip (whimpering or play biting at your hands). When he does this, squeeze (not hard) the opposite paw. He will go back and forth between your hands. TRY to wait until he stops to let him down. Continue every time he jumps, until he realizes jumping is not tolerated. If these two methods don't seem to be working, let me know, and we will try something else. What I have used with my two Labs and have great success with, is the Gentle Leader dog collar. It is a collar that basically goes around the neck right behind the ears and another loop around the muzzle. It works by putting light pressure on your dog's muzzle and at the back of the neck causing him to slow down and wait for you. It may take some time for your Lab to get use to wearing it, so you can leave the gentle leader on him in the house, not attached to the leash. Another bonus of the Gentle Leader is that you can also use it to teach your Labrador to sit, as well as prevent jumping. It will also help when he goes to eat garbage on the ground, when you are walking him. Instructions are provided with the Gentle Leader for this. For his shedding, well that's what Labradors do. I have burned out a vacuum or two cleaning up after mine. Invest in a good slicker brush and/or a shedding blade to help remove loose, dead hair. For the last two weeks, I have been experimenting with a product I found at my local Petco called The Furminator. I am having great success with this, and you won't believe how much loose, dead hair gets removed. It leaves my Lab's coats shiny, healthy and clean smelling. Look this product up on the Internet for more info. I definitely recommend this product. As for bathing, I only bath when absolutely necessary. Too much bathing removes your Labrador Retrievers natural oils. The brushing will help to do a good job of keeping your Labrador Retriever clean. In regards to your Lab eating everything, where is everybody when this is going on. I don't need to tell you that nothing should be left where he can reach it. You can try spraying objects you don't want him to get with Bitter Apple spray. For some it works, others like mine, no good. Plenty of his own toys will help. Nylabone makes many shapes of bones, rings, knots, etc. Again, the Kong toy also. Stores are full of garbage toys that your Lab will quickly chew up and choke on or cause intestinal blockages. Rawhide is especially bad because it swells after being swallowed. Always inspect your Labs toys, when pieces are starting to break off, it's time to discard them. When you do catch your Labrador Retriever chewing on something, give a loud LEAVE IT!" or "DROP IT command and quickly swap it with one of his toys. As for the shock collar, I personally don't use or recommend them, but know of others that do and have had success with them. I know that they also have other collars such as citronella collars, which is a remote controlled corrective collar that emits a citronella spray when you press the button. I have never used these either. Remember, different dogs will respond to different corrections. What works for one, might not work for another. Karen, I hope this is of some help for you. Whatever you don't understand, please ask. Any other questions, also don't hesitate to ask. Keep me informed of what's going on, and how training is going. If some methods don't work, let me know and we will see what else we can do. The following e-mail was sent in from KBWSPIN - Karen (USA). Her Labrador Retriever has a high level of energy , is difficult to handle and has a few others problems that she needs help with. He is almost one year old, we got him at eight weeks old. Sure he is sweet and very handsome, but that is it. I thought maybe it was just me but taking him to couple of different trainers, and my vet they both agree that my lab is in the high spectrum of "lots of energy" and very difficult to handle. That's to put it mildly. I am shocked that they are so popular. I spend at least an average of two hours a day just vacuuming, and cleaning after him. Since we live in Ohio, I am constantly dealing with not only his heavy shedding, but lots of rain which then leads to very dirty dog, very dirty floors and carpeting. My lab has been to the vet more than my other dog in eleven years. He has eaten the wall and gotten sick, eaten toys and got sick and eaten all kinds of other things that I don't even know what he had gotten into and got sick. My house I feel smells like dog crap. When I think of my dog I think of Hair, throw up, diarrhea, and just a mess. I would love to get rid of him, but it would be hard. I am somewhat attached but these days I feel he is much more work then he is a pleasure. I would like to know what are people thinking? I don't get it!! Everyone says they calm down in one, two, four, six and even eight years. I would have never bothered if I realized it would take half his life for him to be good. Thanks for writing and I'm sorry to hear about your situation. First off, you can't mention Labrador Retriever without "lots of energy", that's just what they are about. With your year long research you should have at least found that out. Now please don't think I am chastising you, because I am not and would never do that to anyone, but talk to any Labrador Retriever owner and they will all tell you the same thing; they are full of energy, some worse than the next. With training, grooming and some help (and luck ) I can provide some help for your problems, if you would like. Where did you get your Labrador Retriever (puppy store, breeder, etc.)? Has he had any training, and if so, what kind of training? What else did these trainers and your vet have to say besides " lots of energy" and very difficult to handle? Any kind of medical problems with him? Is your Labrador left alone for periods of time? Do you own a dog cage? What kind of exercise does he get? Believe me KBWSPIN, they do take some work, but they are one of the most lovable, loyal, playful ( I could go on forever) dogs you can ever own. If you want me to try to help you, please answer the above questions and we will take it from there. If you decide you want to get rid him, I can also try to help find another home for him. With all the email questions I receive, I always ask a favor of the person writing. If you have any photos of your Labrador Retriever, that you could email me, I would love to post them to All About Labradors and/or Labrador Retriever Pictures blog. It would also help to find a new home for him if you decide that it isn't going to work with your Labrador Retriever. [Jake eventually became] one of fewer than 200 U.S. government-certified rescue dogs — an animal on 24-hour call to tackle disasters such as building collapses, earthquakes, hurricanes and avalanches. 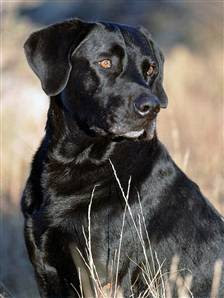 Jake’s owner said Jake’s ashes would be scattered “in places that were important to him,” like his Utah training grounds and near his home where the black Lab swam and played. From Itchmo: News and reviews for cats, dogs, pets and owners. All About Labradors blog sends its deepest condolences to Jake's owner, Mary Flood. Our hearts go out to you on the loss of such an incredible dog, who helped so many others along the way. RIP Jake. Here is an update on Angus "Gus", a black Labrador Retriever who had skin problems and a change in his hair color. I would like to thank Jane for keeping us updated on Angus and how he is doing. Just thought I'd let you know that Gus is now eating a holistic dog food and his ears and eyes are much better. As for the changing fur colour, I understand that it is often caused by a recessive gene and this is what they think it is in his case. We love him anyway as you know. He is attending puppy training classes and his behaviour is improving in many areas however he can have very "selective" hearing when he wants to. We are working on this. He is very strong and I hope his training kicks in quickly as I am disabled on my left side due to a car accident and when I'm alone find my puppy quite challenging - I think he knows my limitations!! I am hopeful soon he'll be better as so many labs become assistants for the disabled ans I like to think there is some of that ability in him too. We live in a small village and there aren't many places to assist with that kind of training - our puppy class people are great but keep saying -"he's just a baby and will be until he's at least 2 years old". However, we persevere and he brings great joy and companionship to me. I appreciate all the help you gave me when I asked about Gus's allergies and fur problems. This e-mail was sent into the All About Labradors blog from Charles (USA). His yellow Labrador Retriever has a problem with her paws being very itchy. We have a Yellow Lab she is about 5 years old, over the last couple of years between her pads on her feet the area turns reddish and itches her like crazy. Initially it would only last a few months and swap from one paw to the other, now for about 10 months it has been in one paw and showing no signs of going away. We have taken her to our vet and he has put her on over the counter allergy medications, she has been on prednizone, and just recently gotten a shot of a steroid. None of these have helped her and my daughter and I are just so worried that she may develop other problems from all the licking she is doing to her foot. Have you heard of this before and is there something out there that may help her? This is the reply e-mail I sent to Charles, along with the answers to my questions in red that Charles had sent back to me. Yes I have heard of the problem you describe and yes I can advise you on some things that may help, but I need you to answer a couple of things for me. Does she lick her paw all the time, or only certain times, such as after walks, after cleaning of house, etc... She pretty much licks her paw all the time, not more noticible after any particular event or walk. What kind of food does she eat (ingredients)? Her primary dog food is _______ I will have to get it later I just tossed the bag. But we buy the same all the time primarily yellow bag blue band pedigree? I believe. P.S. With all the email questions I receive, I always ask a favor of the person writing. If you have any photos of your Lab, that you could email me, I would love to post them to All About Labradors and Labrador Retriever Pictures blog. Labrador Retrievers that lick their feet all the time may have allergies, as your veterinarian believes and had prescribed medication for. Allergies to airborne particles (Inhalant allergies) such as pollen or house dust and to certain foods (Food allergies) can often causes itchy paws. Contact allergies, when Kitty comes into contact with something she is sensitive to, can also cause her itchy paws. Bathing and conditioning is an important part of the treatment for her, as allergens do get absorbed through her skin. A nice cool bath can be helpful, since the water will help assist in relieving the itching. You can add a little colloidal oatmeal (Aveeno) to the bathwater, which will help soothe the foot or your veterinarian, can prescribe an antiseptic shampoo. Make sure you rinse Kitty's foot thoroughly after the bath, since any remaining soap that remains can make the itching worse. You can just soak her foot for five minutes, four times a day, in cool water. Add a sprinkle of Epsom salts to the water as it will also help soothe the foot. A compress applied the paw for approximately five minutes will accomplish the same. Supplementation with Omega 3, 6 and 9 fatty acids may also help. There is a chance that Kitty may be having an allergic reaction to something in her food. Inhalant allergies are much more common than that of food allergies. Because Kitty has not responded to antihistamines or the steroid treatment, the possibility is greater that she might have a food allergy. Some of the most common offenders in dogs are: beef, dairy products, chicken, wheat, chicken eggs, corn, and soy. Charles, take a look at Kitty's dog food label, and you will probably see some of these listed. No unnecessary medications are to begiven. Here are two websites where you can purchase food for the food allergies diet (I am NOT affiliated with either of these websites). If you do try changing her food Charles, I would recommend you go with the duck formula to start. Please keep me informed of Kitty's condition and if you try anything that I've mentioned above. I hope this will be of some help to you and Kitty. If you don't understand anything or have other questions, please e-mail me. Good afternoon to all my All About Labrador readers. Hope all is well with everyone and their Labradors! Thanks for all the questions sent in, and for letting me try to be of some help to you and your Labrador Retrievers. Also, thanks for your patience with the responses, as I answer all the e-mail questions I receive, but it does take some time. Please, when sending in questions please try to include as much information as possible in regards to the situation and if you would like some photos of your Labrador Retriever. Remember, you Do Not have to send in a photo to get a response. OK, enough with my rambling, on to the free anklet from PetStyle. PetStyle will send you a free PetStyle anklet for registering to their website. These are really cute anklets that you can wear anytime to show the world that you are a pet lover. If you are already registered to PetStyle, you are also eligible to receive this anklet by creating a pet profile or updated your existing profile with photos. You have to hurry though, as this offer is valid only until July 26, 2007. Be advise, this offer is limited to U.S. residents 18+ only. This is part two of a two part e-mail that was sent in by Lloyd (USA) in regards to his 20 month old chocolate Labrador Retriever named Peanut, who gets himself all excited around other dogs and is also slightly vocal when going on car rides. We have tried obedience classes and Peanut was sooooo interested in the other dogs in the class that the first 45 minutes he would not pay attention to me. By the last 15 minutes though, he had tired himself out to the point that he was focused on me and he did great. He is awesome with no other dogs around…he pays attention and listens very well. When he sees other dogs though he completely disregards anything I try to do. I think the solution to our problem would be to just keep him around other dogs as much as possible. On that note, do you think it would be more beneficial for him to just take him to the dog park and unleash him and let him do his thing, or to keep him on leash and maintain our distance until he “forgets” about the other dogs? That is more difficult than it sounds as he only weighs about 75 lbs, but is extremely strong!! I weigh about 230lbs and I have a hard time keeping control of him when he makes up his mind that he wants to go towards the other dogs. I think I should probably make sure he gets “heeling” down pat and then take him to the dog park and try it within view of other dogs. I will take a look at the links you sent. Thank you very much for taking time to respond to my dilemma. Hopefully with a lot of patience and persistence on my part, Peanut will overcome his anxiety and behave around other dogs as great as he does around us, because he is a wonderful dog and truly is part of our family. I would definitely work on the "heel" command. You state he pays attention and listens well without other dogs around, so he should get the "heel" command quick. You then have to practice the command with him around the distractions (dogs). I don't think it will hurt to let me play at the dog park every now and then while you are training him. Just watch his body language and interaction with the other dogs. The Halti or Gentle Leader collar, will help when he is distracted, as they provide excellent control, especially when he makes up his mind that he wants to go towards the other dogs. Make sure you read that Attention Please article. The training method by Linda O'Hare Newsome is very helping with handling your dog around other dogs. Having and getting Peanut's attention at all times will be very helpful, if a situation should arise at the dog parks. As for him getting growled at I'm sure this will happen more than one occasion, with Peanut getting in their face. What people fail to realize, is that not all dogs will be friends. The thing that by just putting a dog together with another dog, it will all work itself out. This just doesn't happen, some dogs just can't get along with others. Here is another link to a mini PDF book on Meeting other dogs on the leash and at the dog parks. Keep practicing the training, and keep me informed along the way. Also let me know how the car instances go, and if you try any of the methods I recommended. I want to thank Kaylee for e-mailing me with this free offer. Here is your chance to get a coupon for a free 7.5 oz can of Halo’s Spot’s Stew® for your Labrador Retriever. You will print out this coupon on your computer printer and take it to Whole Foods, Wild Oates, Petco or any other local health food or pet store that offers Spot’s Stew®. This is part one of a two part e-mail that was sent in by Lloyd (USA) in regards to his 20 month old chocolate Labrador Retriever named Peanut. Seems Peanut gets himself all excited around other dogs and is also slightly vocal when going on car rides. My wife and I have a 20 month-old chocolate Labrador whose name is Peanut. We brought him home at 8 weeks old and he has been a great dog for us. He is great around kids and other people. He listens relatively well, but seems to definitely have a mind of his own. He doesn’t respond to praise as some other labs do that I’ve seen, in that he doesn’t get as excited and sometimes seems to ignore it completely. Without going too in depth, he definitely seems to be wired a little differently than most Labs. He has a good lineage, but I know that doesn’t always guarantee perfect offspring. Anyway, we are basically having 2 problems with him that may or may not be related (it seems they might be). As I said previously, he is great around people, but when he sees other dogs he goes absolutely nuts! Not in an aggressive, growling, barking kind of way, but almost instantly whips himself into a frenzy with excitement! He becomes extremely vocal and whines and whinny’s like a horse and is very obnoxious. The fur on his front shoulder blades stands up like a mohawk and he struggles with all of his might to reach that other dog so he can check him or her out. If I am to let him off his leash (at the dog park for instance) he runs at top speed to reach the other dogs and sniffs and plays and gets very up-in-their-face, but never growls or bites or anything of that nature. He just seems sooooooo excited to see other dogs, he literally cannot contain himself. He shows a lot of the same symptoms vocally anytime we put him in a vehicle and take him for a ride. He is fine within the first minute or two, but he gradually works himself up to the point that by the time we get to town 10 minutes later he has a crazy look in his eyes and is whining and whinnying like a horse again! Again…extremely obnoxious. This behavior seems to intensify when we slow down to make a turn or stop and goes through the roof when I turn the blinker on! These are the only two circumstances where I’ve ever seen him exhibit this behavior and I cannot figure out what is causing it, and perhaps more importantly, how to get him to calm down and stop it. I don’t think we let him see other dogs enough when he was very little, and maybe that could partly explain why he goes so crazy when he sees them? I would like to think he would gradually stop this with age, but he’s been doing this since he was a few months old and continues it now. He is not neutered, but after today’s obnoxious and embarrassing experience at the dog park, we are considering it, but I don’t know if that will help or not. Thanks for the great photo of Peanut. What a fitting name for such a big boy. He is beautiful! When they greet each other, defensive whining, when they are showing submissiveness, as an attention-seeking behavior, and when they are in pain. Let’s start off with Peanuts interaction around other dogs. You have a valid point in your letter with the comment "I don’t think we let him see other dogs enough when he was very little, and maybe that could partly explain why he goes so crazy when he sees them". The socialization period (7 - 12 Week of age) is a time, when your dog needs to experience positive interactions with other dogs and people. When dogs don’t get this lesson early in their life, they don’t know how to react around other dogs, which can lead to them being fearful or aggressive. What you also need to know, is that it's also normal for dogs to get excited about greeting other dogs. It’s how they work a social order. Peanut’s hair standing up on his shoulders "hackles" can be a sign of different things; nervousness, excitement, scared / aggression. With what you told me, I’m assuming you feel there is no possibility of aggression. Peanut’s whining when seeing the other dogs is probably his being just so excited to join them. By learning to read Peanut’s body language, you can really get a better understanding of him and what he might do next. When you get a chance, take a look at this website, as it is very informative on this topic: Body Language, Understanding what dogs are "saying". What we are trying to accomplish, is keeping Peanut’s attention on you by teaching him to heal. Now you might say "teaching him to heal, how is that going to help". Believe me, a dog that knows how to heal will never lunge at another dog, animal or person, will never pull, and won’t reach out to sniff other dogs or passersby. When out on walks and in the dog park, use a Halti or Gentle Leader collar on him. The Haltie or Gentle Leader makes it easier for you to control Peanut. Start out with regular walks (I us a six foot leash), keeping Peanut on your left side and have him sit. You’re going to start walking, giving the "heel" command as you start moving. If he doesn’t start, try taping on your left leg to coax him into going. If necessary, a gentle tug and release will help. Remember to keep moving forward and never keep a tight leash. Now, what you want to happen is to keep Peanut in a specific area, while you are walking. Imagine an area to the left (if he is heeling on left), a rectangle, approximately two feet wide and four feet long (two feet in front of your arm and two feet behind). Your job is to keep Peanut in that heeling area at all times or until you give him permission with a release command to stop heeling. I use an "okay" command, but feel free to use what you want. Just make sure it is always the same command, and always give the release command from a sitting position (that is Peanut sitting, not you). Remember, Peanut is to remain in the heeling box at all times. If at any time he starts to walk out of the imaginary box, simply say "heel" and turn either 90 or 180 degrees away from him. Let him run out of leash as you turn, and brace yourself for the tug, but don’t stop walking. After he catches up with you, and he is back in our imaginary box, praise him and say "heel", then praise him again. What you’re doing is teaching Peanut that when he’s in our imaginary box everything is good, and when he’s not, things are not good. You have to make sure you do the turning EVERY TIME Peanut makes his way outside of our imaginary box. Well, what if he sees another person or dog/ If you come across another dog or person on your walk, you will act as though you see absolutely nothing. If Peanut moves outside the box, do your turns. He is to remain in the heeling position, regardless of distractions. He will learn to ignore the distractions. Practice, Practice, Practice. In most cases Lloyd, you will never have to tug on his leash, as the turning will help correct the problem. The only time you might have to give a quick tug and release is if Peanut is adamant in his tugging in one direction and you have no turns left. This is the only time. Once you have Peanut heeling, you will be walking right past other dogs and people, without incident. When it comes time to interact with another dog, by your choice, ask Peanut to sit and wait 'til you give a release command. After the release command, he is free to meet the other dog. Remember, he is not allowed to interact with other dogs while heeling. You can also use treats to get Peanuts attention if he is distracted by another dog while teaching heeling. When your done training for the day, get him to sit and give your release command but keep him on his leash for a few minutes. Play with him, fool around with him, and let him do his business. This will teach Mr. Peanut how to be in release while still on the leash. When you finished with the exercise, have him sit again, remove the leash and then give him the release command. Keep practicing and working up to more distractions as Peanut gets the hang of it. Here is another training option that might also be helpful to you: Attention Please! He might be stressed or excited by riding in the car. The car is constantly vibrating and making noises which might scare him. Another possibility is that he is visually stimulated, with him seeing things coming at him and going by him at fast speeds. If might make him feel like he wants to chase and interact with these things. A crate for him to sit and lay in, which can help restrict his view. A toy added to the crate (I have great success with the Kong toys filled with treats) can help. There is a product called The Calming Cap that is used to ease hyperactivity in a dog that became agitated while traveling in a car, and help to quiet and calm anxious or excitable dogs . You can find out more about this here The Gentle Leader Calming Cap. A dog harness may help him feel more secure and calm him down, not to mention provide safety for him. You need to people in the car for this and plenty of treats or his favorite toy. Take a short trip around your block, and every time Peanut starts his whining and getting crazy, get his attention by saying a word or phrase (ex: “block it”) or whatever you are comfortable with. Once again always use the same word or phrase. Once he hears the word or phrase and you have his attention, offer him his treat (or favorite toy). What you will accomplish with this is that you’re taking his attention off of what ever is bothering him, with the word or phrase and teaching him that these things aren’t going to bother him. As for neutering, I’m not sure that neutering him will help with his problems. It definitely has many health benefits as well as preventing unwanted litters. It will also help whenever a female in heat is nearby, as a male dog that’s not neutered can become quite uncontrollable when this occurs, and can cause confrontation between males that aren’t neutered. I hope you find this to be of some help to Peanut. If you don’t understand anything, please ask. If you have any other questions, also please don’t hesitate to ask. Please keep me updated with how it is going with Peanut, what works, and what doesn’t. Good luck and look forward to hearing from you soon. I am posting some freebies for everyone to take advantage of. These freebies were posted before on this blog, in the beginning of 2006 and are still available. For those of you that have missed out on that posting, and for the new readers to the All About Labrador blog, here's is your chance to try some new product samples for your Labrador Retriever. I'm not sure if you already requested a sample, that you can get another one, but it doesn't hurt to try (just don't tell them I said so). Enjoy! Thank you for visiting All About Labradors blog. Benny Bully's Pet Treats - "A nutritious, pure and natural alternative to traditional pet treats". " Benny Bully's is a HOLISTIC pet treat made from all natural, single ingredient, pure meats, in North American facilities that process human edible foods." Benny Bully's was not associated with the current pet food recall. Halopets.com - "Cooking a home made meal for your pet is easy, and you KNOW that what your pet is eating is whole, nutritious food." For those of you that do make your own home made dog foods, you can print out some free recipes from Andi Brown, founder of Halo, Purely for Pets. Recipe Zaar - here's another website with some recipes for dog foods and treats.